The vivo X23 appeared in the wild some time ago, but better-looking images surfaced on Friday, revealing the design of the smartphone. It looks a lot like the vivo V11 Pro that is getting announced in India on September 6. The X23 should be announced today, but it appeared in a live TV show during the weekend, revealing the front of the design. 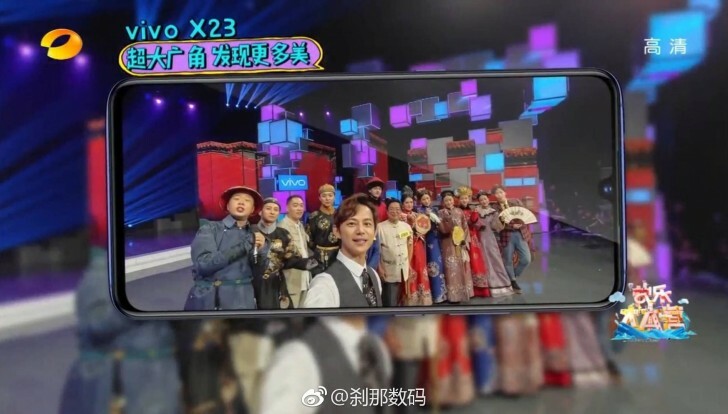 The host of the show decided to wrap up with a photo of his guests, putting the vivo X23 on a selfie stick. It clearly is a promo of the device since the host explained about the AI features of the camera while setting up the device for the photo. The vivo X23 is expected to arrive with 6.4” screen, 3D Face scanner and an in-display fingerprint scanner. The chipset is expected to be Snapdragon 670, coupled with 8 GB RAM. While there is no info on the camera, we expect a similar 12 MP + 5 MP setup, seen in previous vivo X phones, but with more AI-branded features. Stay around for today’s launch. We will follow closely the vivo X23 announcement and will let you know once everything is official. I just cant understand why not move the chin up so you dont need the dumb notch and have all your cameras and other sensors in there.